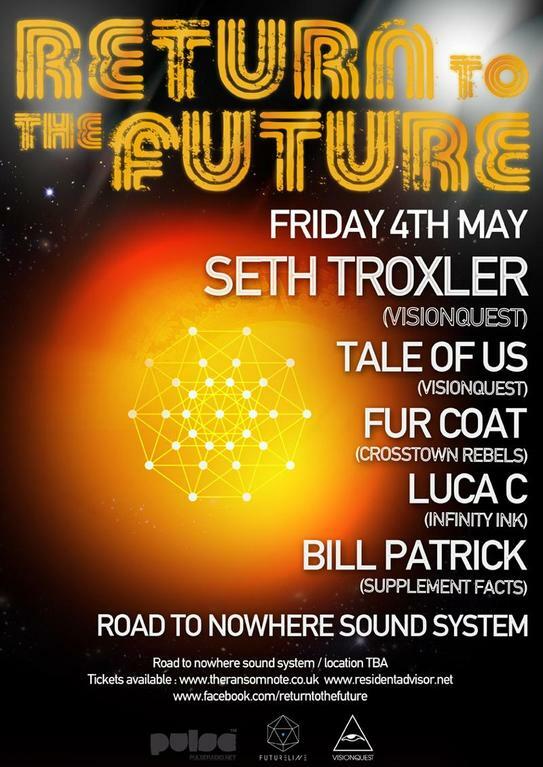 Return To The Future is back for its fourth party installment with main headliner Seth Troxler. Seth has been voted in the top three DJs in the world on Resident Advisor for two consecutive years and via his Visionquest imprint, started with Shaun Reeves, Ryan Crosson and Lee Curtiss, he has spawned one of the most exciting new record labels in dance music today. Support includes Tale Of Us, the Berlin-based DJ and production partnership, Karm and Matteo, who are re-writing the rulebook for deeply moving, emotional electronic music. Together they share a sonic vision that pulls together elements of house and techno with influences from pop, nu-disco and even rock music. The duo is already regular fixtures at clubs like Watergate and Weekend in Berlin, Tenax in Florence, Barraca In Valencia and DC10 in Ibiza. Plucked from South American obscurity by Damian Lazarus for his Crosstown Rebels imprint, Fur Coat is one of the most hotly tipped new acts around. It was the duo's blending of live vocals, serious grooves and a heavily funk indebted sound which had Lazarus snap them up, first to remix Russ Yallop, then for a full release entitled 'Space Ballad' which shot to prominence thanks to a killer Totally Enormous Extinct Dinosaurs remix. Luca C is the rebellious kid from Milan who was born with a gift for piano and guitar and began writing songs by the age of 15. After playing in various bands, Luca moved to London and joined indie / electro outfit The Cazals, signing to French imprint Kitsune and thus supporting Daft Punk on tour. After The Cazals split, Luca began to focus on his DJ career, passionately delving deep into his procured disco, house and techno record collection. Production wise, he began working with long-time friend Ali Love, co-producing his album in 2010 and in 2011 they formed Infinity Inc, with releases already signed to Hot Creations and Crosstown Rebels. Luca also partnered with Brigante, working on more Balearic disco music and signed album 'Invisible Cities' to Southern Fried.